>> Who Owns Rudolph’s Nose? When I was in college in the early 80s, I had a part-time job during the holiday season at one of Baltimore’s tonier department stores ~ Hutzler’s. I was both voices of the nearly life-sized puppet reindeer couple Tinsel and Beau. Tinsel and Beau lived in a little snow covered cottage in a section of the store cordoned off by purple velvet rope. Inside the rope next to their cottage was a beautifully adorned Christmas tree with shimmering presents piled high underneath. When you walked up to Tinsel and Beau's house, you walked into Christmas magic. Hutzler's Tinsel and Beau asleep with their eye covers on between shows (courtesy of Shirley Brewer). Mothers brought their children and teachers brought their young students to be entertained by these wondrous creatures in the days leading up to Christmas. I sat inside a cramped little wooden box with one arm extended through Tinsel’s neck operating her mouth and moving her head and my other arm doing the same with Beau. I spoke through a microphone with my best girl and boy reindeer impersonations. The children asked questions, we’d sing songs together, or I would read Christmas stories while they sat in (mostly) rapt attention. One of the most common questions was whether we helped pull Santa’s sleigh. . . because we were in the song, weren’t we? And besides, where was Rudolph? Did we know Rudolph? Tinsel and Beau were reindeer characters created by someone in Hutzler’s marketing department and I wasn’t given much training when I took the job. "Climb in there and start talking," was about it. So I had to create a whole backstory to fit into the well-known North Pole fairy tale. 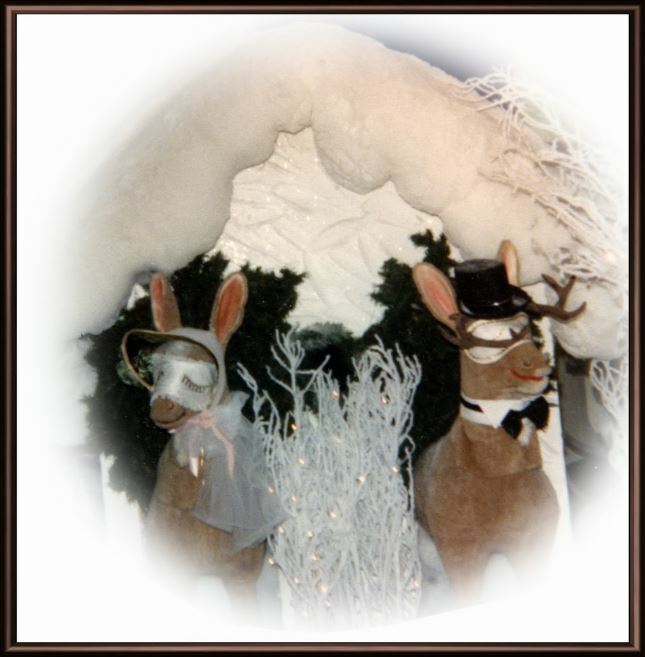 At the time (before I became a creative protectionist), I thought it was pretty silly that Hutzler’s didn’t use Prancer and Dancer or Comet and Vixen as their holiday reindeer attractions – clearly more high profile reindeer couples – or even Rudolph alone. Reindeer with an already well known backstory. It turns out that Hutzler’s knew what it was doing when it created Tinsel and Beau. Over the years, Tinsel and Beau became identified with Hutzler’s in Baltimore. They were part of Hutzler’s holiday marketing and branding concept. That kind of identification is what trademark rights are all about - source identification. And by creating their own proprietary reindeer personalities, Hutzler’s avoided infringing the most famous reindeer of all. During the Great Depression, Chicago-based department store Montgomery Ward bought coloring books to give to children at Christmas. In the late ‘30s, they decided that it would be less expensive to have one of their employees create a children’s story rather than to buy preprinted storybooks on the market. 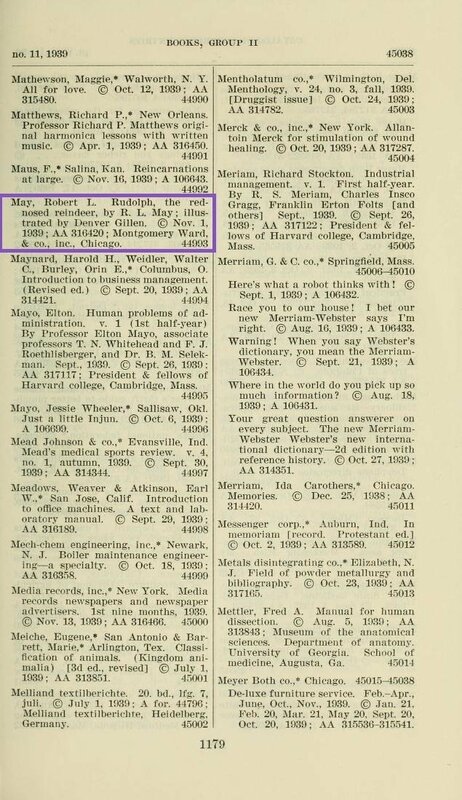 In 1939, Robert L. May, a poet who worked for Montgomery Ward was given the assignment. May had a young daughter to whom he read his story as he wrote it to make sure it would resonate with his intended audience. It was a fabulous success in its first year and almost 2 ½ million copies were given away for free that Christmas by the store. Because May was an employee of Montgomery Ward, the copyright in Rudolf the Red-Nosed Reindeer was owned and registered by the company as a "work for hire." During the war years, there was a paper shortage and Montgomery Ward was unable to reprint and give the story away again until 1946. That year, it soared once more to popularity with an additional 5 million copies being distributed. In 1947, May was approached by a New York house that wanted to publish the story as a book and sell it. Other publishers had considered the idea but passed on it because so many copies had already been given away for free. Use this quick and easy guide to help you decide whether a use you plan to make of someone else's work is fair, or if someone has made fair use of your work. 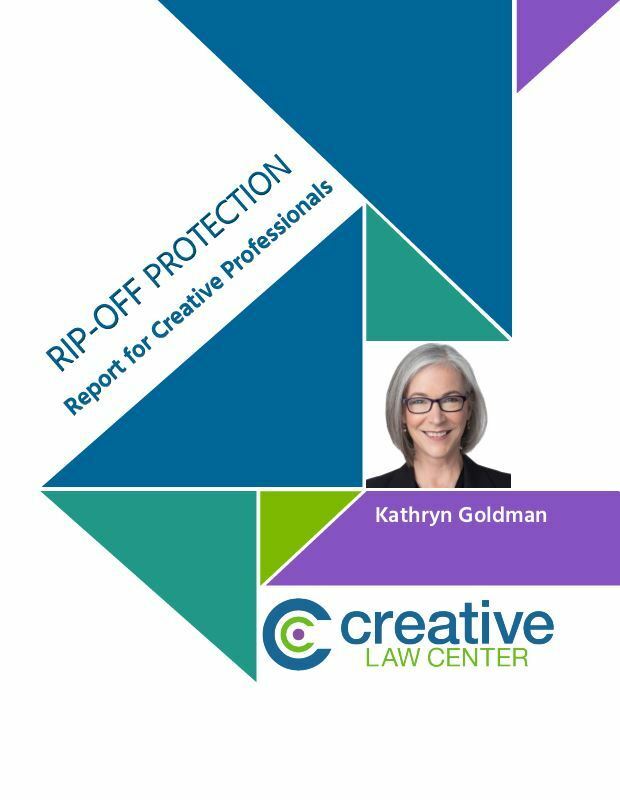 When you download this guide, you will be added to the email list for the Creative Law Center. May told the publisher, Maxton Books for Little People, that he couldn’t agree to a publishing deal because he didn’t own the copyright in the story he had written. Apparently, that state of affairs didn’t sit well with those in charge at Montgomery Ward and the president of the company, Sewall Avery, gave May back the copyright in Rudolph the Red Nosed Reindeer. The book was published on October 4, 1947. The 1947 catalog entry references the 1939 version. There's probably an official transfer document somewhere assigning the rights from Montgomery Ward to May. Searching the copyright records before 1978 can be a hit-or-miss challenge. Searching transfer documents would probably take a trip to Washington and the assistance of the reference librarians at the Copyright Office. 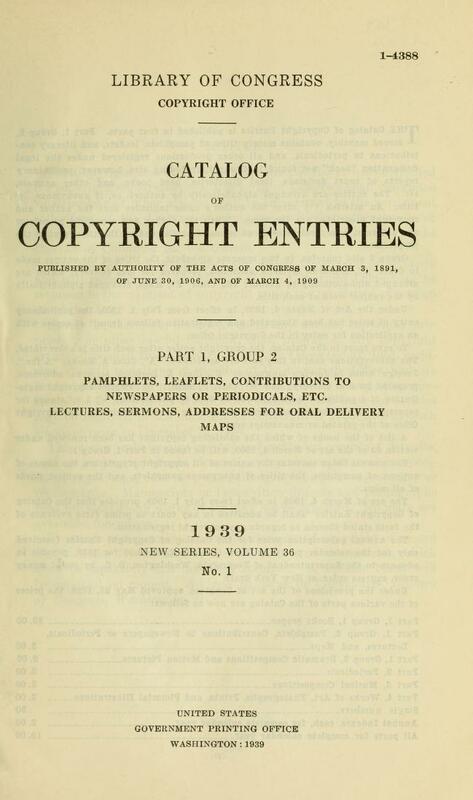 Under the copyright law in effect before the Copyright Act of 1976, in order to maintain rights, the owner had to renew the copyright in the 28th year after registration. Mr. May took care of business and renewed his copyright in Rudolf in 1967. The copyright in the 1939 version of Rudolph expires in 2034 at which point it enters the public domain. The children's TV show was created in 1964 and, most likely, is protected by a new copyright and a series of licenses. Robert L. May died in 1976. But before he did, he established The Rudolph﻿ ﻿C﻿ompany that holds the rights to Rudolph. Licenses are managed by a professional agency all to the benefit of Mr. May's children and grandchildren. What makes this a holly-jolly Christmas story for me is knowing that the heirs of someone who would have been an unknown author are still benefiting from copyright protection, properly registered and renewed, that was returned to him by an employer who couldn't have been less Scrooge-like. I have been portraying Santa Claus every Christmas at stores and personal home visits for many years. I am asked questions, just as all Santa’s are asked, which I have never been stumped. Anyway, I am also a writer and have written a story about another reindeer with a shiny red nose. Is this legal to publish? Your question can’t be answered in a blog post comment, unfortunately. It requires a clearance analysis. Rudolph isn’t only protected by copyright, he may also be protected by trademark. Trademark raises the issue of whether there might be consumer confusion between your shiny-nosed reindeer and Rudolph. So, I really can’t give you an answer on this one without digging into some research and comparing your work to the original. I would like to know if I can use the term ” Red Nose Reindeers” Legally? I have a story that doesn’t directly refer to Rudolph but a group of Red Nose Reindeers. Thank you for your blog. I have created a new reindeer and he is one of Rudolph’s friends and helps Santa navigate through storms. Can I use the name Rudolph as long as the story is not about him? Do you want to just say something like, “I’m Norman, one of Santa’s reindeer and Rudolph is my friend” then go on with a story that has nothing to do with Rudolph? I think that would be OK. If it’s less like fan fiction and more like a passing reference to a famous reindeer, it might work. This is an excellent copyright-themed Christmas story that I have not read about in other articles or blog. This might be the only time I can recall a corporation “transferring” its copyright to its work-for-hire employee author! This is only supposed to happen in fairy tales, not in real life. A Thought: After Sewall Avery retired/was replaced by another Montgomery Ward president, do you suppose the corporate suits ever thought about exercising the firm’s copyright termination rights (56-years) to recapture its copyright back from Robert May? This would have certainly been cruel and Grinch-like + in-line with a corporation’s real life economic interests. This story really interests me. I read another story from the lawyer working with the Rudolph company who successfully sued a company making a Rudolph-like toy who named their product “Rood”. What I’m wondering is if they had simply not put a name to their product, would it have still been a copyright infringement? In other words can someone create a product with a reindeer with a glowing red nose, forgo putting a name to the character, and be ok? Ah, yes, Rudolph and Robert L. May. Back in the eighties, when I wrote SANTA STEPS OUT: A FAIRY TALE FOR GROWN-UPS, I was going to use Rudolph as the lead reindeer. In my research, I discovered that the copyright you mention would prevent that. So I invented Lucifer (“light-bearer”) and gave him a glowing nose but not a red one. In my author’s afterword, I explain why I did that. So wonderful that Montgomery Ward gave the rights to Mr. May! And what category would that be? Don’t you put me in your next book! At least not as Tinsel and Beau. Fun-loving, animated, playful! And don’t worry, my characters are all fictional! Yup. That’s me! And Tinsel and Beau were real, so that leaves them out. Hi Kathryn, This is a great article. I would like to share it on my facebook page for all of my author friends to read. 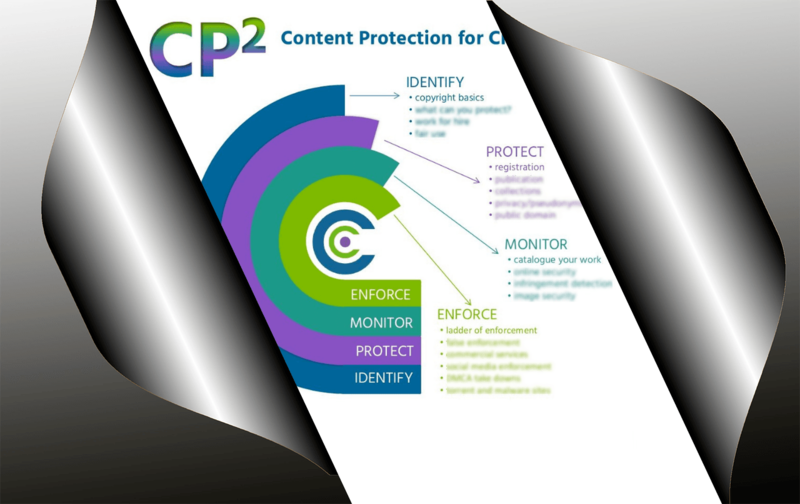 It really brings home the importance of copyright protection and better planning of our work. I’m glad you like it. Please share. Protecting your creations improves your ability to earn from them. Of that, I have no doubt.